A DETECTIVE, Azman (Shaheizy), and a forensic photographer, Adam, (Iedil) are investigating a series of ritualistic murders. The more they investigate, the more bizarre and supernatural the case becomes. At the same time, Adam, who is distressed by the daily violence and death he has to deal with, is approached by new neighbour Iva (Prisia). Adam soon learns that Iva is connected with the murders, and realises that the motive for the crimes is something beyond his imagination. I loved director Dain Said’s earlier film Bunohan very much. I wish I could say the same for Interchange. The film starts out strong, with a scene where the characters find a dead body in a seedy nightclub. That piques my interest regarding the murderer and the motive for the killing. But as the film progresses, sad to say, I lose interest. 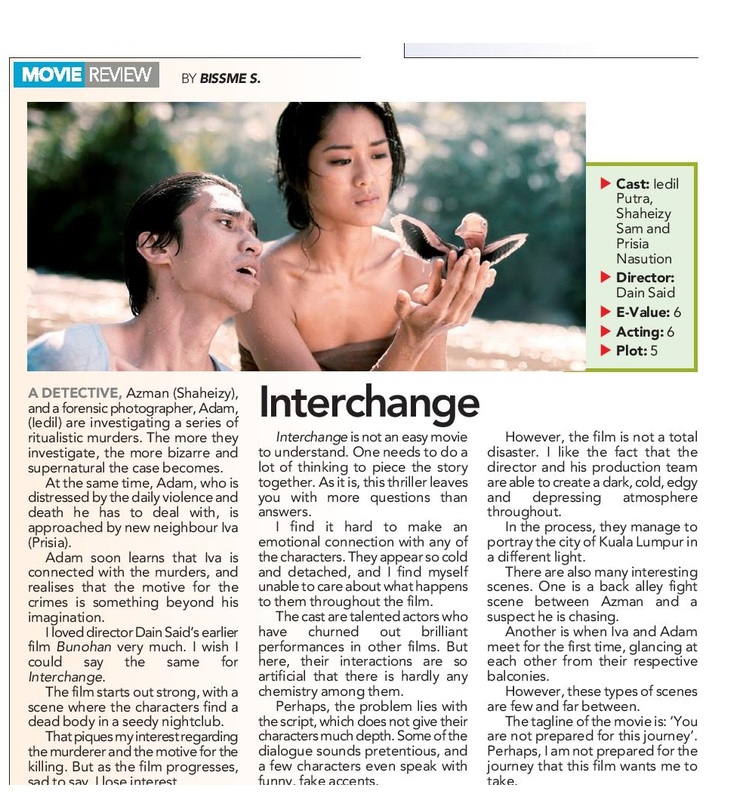 Interchange is not an easy movie to understand. One needs to do a lot of thinking to piece the story together. As it is, this thriller leaves you with more questions than answers. I find it hard to make an emotional connection with any of the characters. They appear so cold and detached, and I find myself unable to care about what happens to them throughout the film. The cast are talented actors who have churned out brilliant performances in other films. But here, their interactions are so artificial that there is hardly any chemistry among them. Perhaps, the problem lies with the script, which does not give their characters much depth. Some of the dialogue sounds pretentious, and a few characters even speak with funny, fake accents. However, the film is not a total disaster. I like the fact that the director and his production team are able to create a dark, cold, edgy and depressing atmosphere throughout. In the process, they manage to portray the city of Kuala Lumpur in a different light. There are also many interesting scenes. One is a back alley fight scene between Azman and a suspect he is chasing. Another is when Iva and Adam meet for the first time, glancing at each other from their respective balconies. However, these types of scenes are few and far between. The tagline of the movie is: ‘You are not prepared for this journey’. Perhaps, I am not prepared for the journey that this film wants me to take.